This article principally uses the GWR classification system for boilers, originated under Churchward, which divided boilers into classes based on the physical size of the boiler and thus which locomotives it will fit. This system consisted of a two letter code. The first letter is normally regarded as the boiler class, and indicated the principle dimensions of the boiler. The second letter can be regarded as a subclass, and in some cases there were twenty or more of these. Differences between subclasses would include superheat (presence and degree), water feed type and location, firebox type as well as subtler things like minor variations in dimensions and the presence or absence of brackets to locate the boiler or tanks, which would have an influence on exactly which locos a boiler could be fitted to. Most of the classes also had names, usually either a standard number, or else that of a class associated with the boiler. Another system which will be encountered is that used in the RCTS volumes. This complex system enables classification of the appearance of boilers, and is usually one or more letters followed by a number, which describe firebox type and dome location (or absence). The RCTS volumes further allocate boilers to over 100 "Groups", which are boilers of substantially similar type. Note that the two systems have very little overlap. RCTS describes boilers of several different classes as being R3 or D4 and even in the case of their 100 odd groups some groups contain boilers of more than one GWR sub class and vice versa. It's worth noting that Broad gauge and Narrow (=Standard) gauge locomotives were, in the middle of the 19thC, designed by different designers and built at different workshops. There seems to have been little interchange between the two. When Gooch was in charge at Paddington/Swindon he seems to have largely delegated responsibility for standard gauge affairs to Joseph Armstrong at Wolverhampton, producing only a few designs for the narrow gauge. These had quite standardised boilers, typically domeless with raised round topped or (earlier) dome shaped fireboxes. Joseph Armstrong moved to Swindon when he was appointed to replace Gooch, and his brother George Armstrong took over at Wolverhampton and maintained his own line of development. Boilers with domes and without raised fireboxes appeared with Joseph Armstrong's 360 class goods type of 1866. These were followed by the numerous 0-6-0 Standard Goods and the Sir Daniel 2-2-2s, which had, as it turned out, the first two of what were to become standard boiler classes - boilers based on those for these classes were in use 70 years later. Under the Armstrongs and William Dean one sees these parallel boilers without raised fireboxes as being the dominant type. Domes moved forward and back along the boilers and pressures increased, but the external style was generally reasonably consistent. Other boilers introduced in this era that became widely used were on the Dean Goods and Metro classes. Churchward was the main innovator when it came to boilers. His work started under Dean, but during that era one can see a definite progression, worked out it would seem mainly with the 4-4-0s like the Badminton class, and then the early 4-6-0s. What became the standard tapered GWR boilers started out with parallel barrels with a considerably raised belpaire firebox - perhaps 8 inches above the boiler. Some of these had domes and some did not. The taper came later, strongly influenced, it seems, by the Brooks Locomotive Works of the USA. Having noted the Wolverhampton ancestry of narrow gauge design its perhaps appropriate to comment that significantly raised round-top fireboxes were very much a broad gauge feature. At the same time there was also much development of the earlier parallel boiler types. The development of these is much less obvious to the uneducated eye, but it is clear that there was a great deal of work with all sorts of variations in tube layout and the like. Although various domeless types were tried, in the end it appears it was decided that, with room to make them of generous size as there was with the smaller locomotives, the increase in steam space and freedom from priming provided by the dome at a moderate cost in weight was justified. Weight was a significant design factor. The Standard 2 and Standard 4 were variations on a theme to keep the weight, and thus axle loading and route availability within bounds on some classes, but in general Churchward locomotives were within the available limits. However post WW1 schemes were drafted for uprating 2800, 2900 and 4000 classes with the Std 7 boiler. These would most likely have been very potent locomotives, but the enlarged Saint and Star designs could not be managed at all within the required weight limits, and the 2800 would have had reduced route availability. Other Churchward developments included top feed and superheating. Top feed meant that boiler water was introduced through the top of the boiler, and delivered onto trays. These trays sloped down to the front f the boiler barrel where they had notched ends so that the water fell onto the main water in the barrel in a series of fine streams. This all led to increased boiler life. In the 20thC the major development was superheating. A "saturated" boiler normally has all the fire tubes of around the same size, on the GWR typically between 15/8" and 2". In a superheated boiler a number of rows of the small tubes are replaced by fewer rows of fewer large tubes, on the GWR typically a bit over 5". Into these large tubes are inserted superheater "elements". These are usually tubes in a U shaped arrangement, about the length of the barrel, and depending on the design, on the GWR there were usually 4 or 6 of them in each large tube. After the steam leaves the main boiler space it passes through the regulator and then these tubes on the way to the cylinders. Steam in the main boiler will not heat to above the boiling point of water because of the presence of liquid water, but there is no liquid water in the superheater and the temperature of the steam may be considerably increased, which increases both the power and efficiency of the locomotive. The primary drawback to the increased steam temperature is lubrication. The high temperatures carbonise the oil, more oil is required to maintain adequate lubrication and the steam passages, valves and pistons become coated with carbon. After early experiments with a high degree of superheat Churchward opted to use only moderate superheat. Superheat, although much tested on various pannier tank classes, was eventually rejected for the smaller classes used extensively for shunting. I understand that it appreciably reduces the speed of response to the regulator which makes shunting more difficult. Collett immediately ran into the problems with weight that had prevented Churchward from upgrading Stars and Saints with Standard 7 boilers. The Castle's Standard 8 boiler was effectively a Standard 7 with a smaller diameter barrel, intermediate between the Standard 1 and the Standard 7, and brought the locomotive right up to the weight limit. The King's Standard 12 was an enlarged Standard 7 up to a new weight limit for a limited number of routes. The Manor brought another problem since it required a higher capacity boiler (and especially a larger firebox and grate area) than the Standard 4 of the 4300 it was replacing. However the locos needed to be much lighter their sisters, the Granges with Standard 1 boilers, so the all new Standard 14 had to be designed. It came between a Standard 2 and a Standard 1 in all the main dimensions. Collett also introduced high tensile strength nickel alloy steel to build some boilers, mainly Standard 2 for 2-6-2 tanks, of higher pressure but no extra weight. Collett's other problem was several hundred absorbed locomotives with what must have seemed like several hundred designs of boiler. GWR maintenance practice required a stock of spare boilers, and clearly this would be impractical. So three of the standard boiler designs were modified, mainly with different fireboxes, and these were widely used on rebuilds of absorbed locomotives that could not be adapted for existing standard boiler designs. 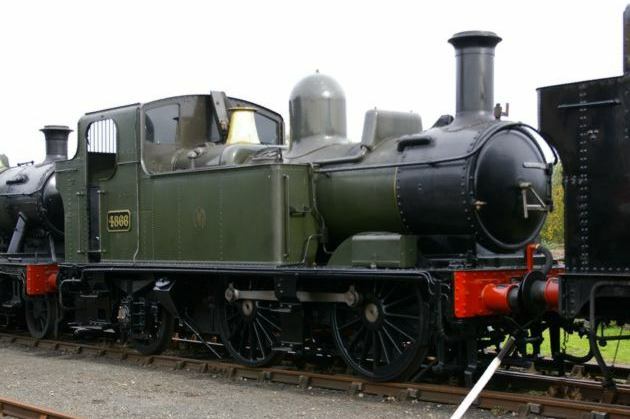 The Standard 9 and 11 were based on Dean era parallel boilers, but with longer fireboxes, and the Standard 10, which was later used on new GWR 0-6-0 and 0-6-0T designs, was a short taper boiler based on the Standard 2/3. Hawksworth must have had similar weight problems when designing the County. A Standard 8 Castle boiler would presumably have been a possibility, especially if Hawkesworth could have accepted the lower boiler pressure, but tooling was available from building LMS 8F (hence W.A. Stanier designed) boilers for the MOD, and this was used to build a notably shorter and stumpier boiler than the GWR designs. Collett had followed Churchward's lead in using only moderate superheat even when better lubricants were available. With the high quality coal available to the GWR this brought no steaming problems. During and after the war, however, the quality of coal available diminished significantly and higher degrees of superheat were introduced, much later than with other lines. 0-6-0T classes 4'2 4'3 11'0 1059 5'4 99 0 1158 15.6 flat Somewhat interchangeable with O. Extinct by 1940s. some large 0-6-0T 4'4 4'5 11'0 1180 5'4 106 0 1286 15.5 flat Extinct by 1940s. Somewhat interchangeable with Q.
J Standard 9 various absorbed 4'4 4'5 10'3 961 6'6 104 75 1140 19.7 sloping Modified P class. G Standard 7 4700 5'6 6'0 14'10 2062 10' 170 288 2519 30.3 part sloping drum Used only on a class of 9 locomotives, but considered for use in several design proposals. This table needs to be read with considerable caution. In particular the heating surfaces varied considerably over the years. Just because boilers were outwardly of the same dimensions and interchangeable doesn't mean that they were the same inside. There were very great differences. Superheated boilers would have much lower heating surface area in the tubes than saturated boilers because the superheater elements were installed in large tubes. Looking at the dimensions over the years there was a definite tendency for the heating surface in the tubes to be reduced, even without changes to the degree of superheating. There seems also to have been a tendency for the size of superheaters to reduce: later versions of the 4 row superheater in Castles had less surface area then earlier ones, but of course still far more than the three row ones. To give an idea of this I have included the dimensions of the 4 subtypes of Standard 8, fitted only to the Castle Class. Even within those there were variations: for all of them superheater size was later varied, generally reducing slightly with shorter elements. In general, and with obvious exceptions, I have picked values for sub classes of boilers built in larger numbers during the 1930s, and definitely not those of the post war higher superheat developments. The Standard 4 (D) is a short version of the Standard 1 (A), with both firebox and barrel shorter. The Standard 2 (B) has very much the same size firebox as the Standard 4, but a smaller diameter barrel of the same length. The Std 3 (C)was a standard 2 with a shorter barrel. The Std 10 (K) is a Std 3 with a shorter firebox. The Std 7 (G) had the same diameters as the Std 6 (F - Great Bear), but with a conventional firebox and a much shorter tapered barrel. The Std 8 (H) is a Std 7 with a smaller diameter barrel and a slightly smaller firebox. The Std 12 (W - King Class) has the same diamters as a Std 7 with lengthened barrel and firebox. Std 16 (Q - reused code) is basically a U class with a drum style smokebox. R,V and S are the same diameter as the U with different firebox and in the case of the V also different barrel lengths. Boilers used on the 4800/1400 class (SS, ST, SU, SV) were basically an S class with a drum style smokebox.